Background: Vitamin D plays a unique role in promoting embryonic and neural development, cerebral immunological regulation, and influencing neural differentiation and gene regulation. Vitamin D deficiency may be one of the environmental risk factors for autism spectrum disorder. This trial has two purposes: (1) correlating single nucleotide polymorphisms of vitamin D metabolism-related key enzymes to autism susceptibility; and (2) investigating the therapeutic effect of exogenous vitamin D on autism spectrum disorder. Methods/Design: A non-randomized parallel-cohort controlled trial. Sixty children with autism spectrum disorder who receive treatment at the Department of Pediatric Neurological Rehabilitation, First Hospital, Jilin University, China, are included. Sixty healthy controls are also recruited from those undergoing a physical examination. For the first purpose, primary outcomes include vitamin D metabolism and single nucleotide polymorphisms of related genes. Vitamin D level in peripheral blood is the secondary outcome. For the second purpose, 60 children with autism spectrum disorder are treated with exogenous vitamin D supplementation. Prior to and 1 month after exogenous vitamin D supplementation, primary outcomes are evaluated, including the Childhood Autism Rating Scale (CARS) score, Autism Behavior Checklist (ABC) score, the Gesell Developmental Schedules (GDS) score, Clinical Global Impression Scale-(CGI) for severity of illness (SI), global improvement (GI), and efficacy index (EI) scores. Again, vitamin D levels in peripheral blood are evaluated as the secondary outcome. Discussion: This trial is sufficiently powered to provide scientific evidence for the genetic and pathological mechanism of autism spectrum disorder in children that lack vitamin D.
Trial registration: Chinese Clinical Trial Registry (http://www.chictr.org.cn/index.aspx) identifier: ChiCTR-TRC-14004499; registered on 30 November 2013. Ethical issues: This trial was approved by the Medical Ethics Committee, First Hospital of Jilin University, China (approval No. 2013-192). The trial protocol will be performed in accordance with the Declaration of Helsinki. Autism spectrum disorder (ASD) refers to a group of pervasive developmental disorders characterized by persistent deficits in social communication and social interaction, and restricted, repetitive patterns of behavior or interest. The National Cancer Institute (NCI) Centers for Disease Control and Prevention (CDC) estimates that the incidence of ASD in the USA is approximately 14.7% i.e., one out of 68 children suffers from ASD (Developmental Disabilities Monitoring Network Surveillance Year 2010 Principal Investigators, 2014). In contrast, the incidence of ASD in Asia and Europe is around 1% (Kim et al., 2011; Parner et al., 2011). No effective drugs have been developed for the treatment of ASD (Aman et al., 2009). Furthermore, little is known about its etiological factors and pathological mechanisms, although it is likely to be caused by an interaction between genetic and environmental factors (Strömland et al., 1994; Hall et al., 2008; Christensen et al., 2013; Huguet et al., 2013). Recently, vitamin D has been shown to protect the skeleton by regulating calcium and phosphorus metabolism (DeLuca, 1980). It also plays an important role in fetal and early postnatal brain development (Groves et al., 2014; Lardner, 2015). Moreover, there is evidence that peripheral blood levels of vitamin D are significantly lower in children with ASD than in healthy controls (Wang et al., 2015). This is consistent with our previous clinical findings (Jia et al., 2015), which suggest that vitamin D deficiency may be a leading factor for ASD development. The cause of vitamin D deficiency is likely to be related to environmental and/or genetic factors. Vitamin D is sourced from food and self-synthesis in vivo, with the latter being the main source. The vitamin D precursor, 7-dehydrocholesterol, is converted to previtamin D3 in the skin by exposure to ultraviolet irradiation. Next, previtamin D3 is isomerized to vitamin D3, which is then released into the blood, where it binds to the vitamin D binding protein (DBP) for transport to the liver. In the liver, vitamin D3 is converted by the action of 25-hydroxylase (CYP2R1) into 25(OH)D 3 . After binding to DBP, it is subsequently transported into the kidney and converted into 1,25(OH) 2 D 3 by the action of 25-hydroxyvitamin D 3 1-α-hydroxylase (CYP27B1). Consequently, 1,25(OH) 2 D 3 acts within cells or is deposited in adipocytes. Furthermore, 1,25(OH)D 3 and 1,25(OH) 2 D 3 can generate 25,24(OH) 2 D 3 by the action of 25-hydroxyvitamin D 3 24-hydroxylase (CYP24A1), which is discharged outside the body via bile (Leroith, 2010; Lange, 2012; Morris et al., 2014) ([Figure 1]). 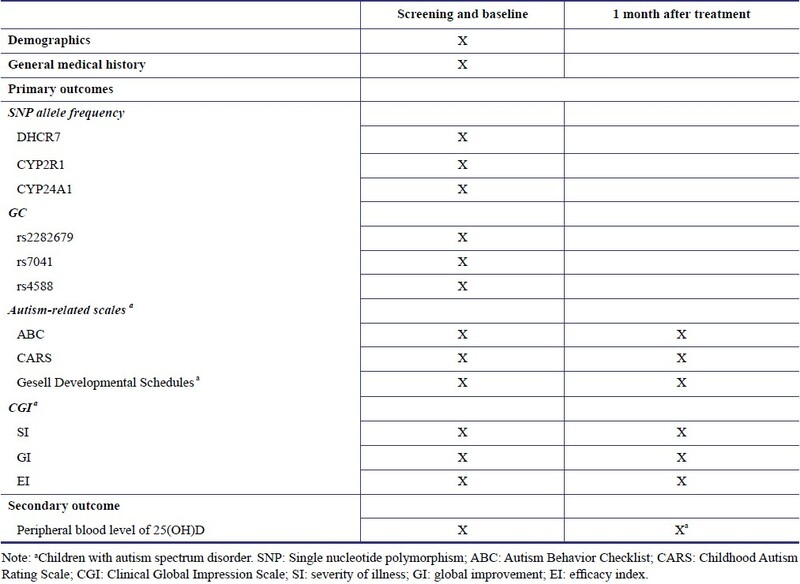 Here, the purpose of this trial is to correlate single nucleotide polymorphisms (SNP) of vitamin D metabolism-related key enzymes to autism susceptibility. Figure 1: Metabolism of vitamin D in vivo. Compared to vitamin D, 1,25(OH) 2 D and 25(OH)D have longer half-life periods (Clements et al., 1992) and are present at higher concentrations. Therefore, they are considered the optimal index to evaluate vitamin D nutritional status (Clements et al., 1992). Determination of vitamin D levels in ASD patients is possible by measuring and comparing peripheral blood levels of 25(OH)D with healthy controls. Jia et al. (2015) has confirmed that vitamin D supplementation can effectively improve symptoms in children with ASD. 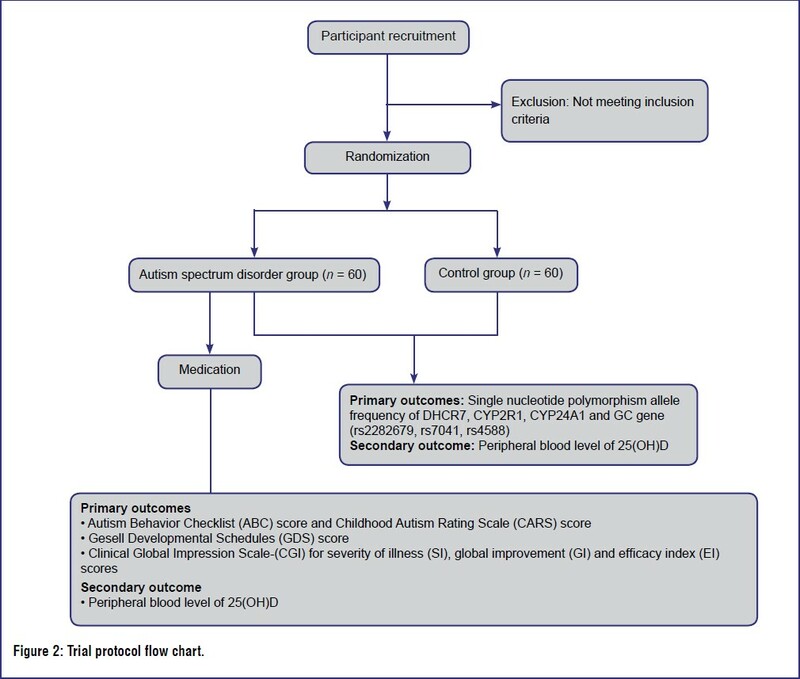 Based on this, we hypothesize that vitamin D can improve ASD symptoms, and choose to validate our assumption via a non-randomized parallel cohort-controlled trial. A non-randomized parallel-cohort controlled trial. Rehabilitation Center, First Hospital of Jilin University, China. This trial involves gene sequencing. The participant's guardians are informed of the trial protocol and potential benefits and risk. The genetic research results are limited to scientific research and will not be divulged to others. Moreover, information resulting from the genetic research will not be available to the participants or their guardians. Signed written informed consent should be obtained from each participant's guardian. Written approval should be obtained from the Medical Ethical Committee, First Hospital, Jilin University, China (Approval No. 2013-192). The trial protocol will be performed in accordance with the Declaration of Helsinki. Sixty children ASD patients who will receive treatment at the Department of Pediatric Neurological Rehabilitation, First Hospital, Jilin University, China, and healthy controls that will have concurrently undergone a physical examination. Vitamin D therapy: in the ASD group, children patients receive alfacalcidol (0.5 μg/d, oral, 30 successive days) or alfacalcidol (0.5 μg/d, oral, 30 successive days) + vitamin D3 (150,000 units/month). A flow chart of the trial is shown in [Figure 2]. Figure 2: Trial protocol flow chart. All responsible physicians, patients, and guardians are informed of the patient's condition and intervention measures. However, outcome assessors are blinded to the groups to avoid evaluation bias. Timing of the outcome evaluation is shown in [Table 1]. During the trial, any adverse events and other unexpected reactions should be recorded, evaluated, reported, and investigated. Corresponding solutions will be proposed and disposal outcomes recorded. The nature, severity, and drug correlations of all adverse events will be identified. to the Good Clinical Practices document, all trial records are kept in a secure, locked storage area by a designated person. All records will be preserved for at least 5 years. All data are statistically processed using SPSS17.0 software (SPSS, Chicago, IL, USA). Genotype and allele frequency are expressed as n(%), and compared between ASD and control groups. Vitamin D levels in ASD patients prior to and after vitamin D supplementation, and related scale scores are expressed as the mean ± SD. Paired sample t-tests are used for comparison between ASD and control groups. A level of P < 0.05 is considered statistically significant. Autism is a social issue that needs to be addressed due to its worldwide prevalence in children. Vitamin D plays an important role in brain development (Groves et al., 2014; Lardner, 2015), and children with ASD have an obvious disorder of brain development (Stoner et al., 2014; Zielinski et al., 2014). Cannell first proposed the hypothesis that vitamin D deficiency can cause ASD in 2008 (Cannell et al., 2008). Our previous findings have confirmed that vitamin D can improve ASD symptoms in children, including the persistent deficits in social communication and social interaction, restricted, repetitive patterns of behavior or interest, and also emotional and sleep disorders (Jia et al., 2015). If our randomized parallel-cohort controlled trial identifies a correlation between SNPs from vitamin D metabolism-related key enzymes and autism susceptibility, and also confirms that vitamin D improves ASD symptoms, then our findings will lay the foundation for scientific research regarding the causes of vitamin D deficiency in children with ASD. Our findings will also be beneficial to the underlying pathological mechanism of ASD, and provide clinical evidence for ASD treatment. The curative effects of vitamin D on autism was completed in April 2015 (article has been in the typesetting stage). The rest of the research is ongoing. In January 2015, FYJ and his colleagues treated one 32-month-old male ASD patient who presented with vitamin D 3 deficiency. After 2 months of vitamin D 3 supplementation, decreased ABC, CARS, and CGI scores (from 80, 35, and 6 to 39, 28, and 4, respectively) were observed. These findings indicate that the main symptoms of autism had improved, and suggest that vitamin D 3 plays an important role in autism pathology. In addition, clinical detection of blood vitamin D 3 levels, and in time, vitamin D 3 supplementation may be of importance for autism. In January 2015, FYJ and his colleagues also performed high performance liquid chromatogram-tandem mass spectrometry to detect 25(OH)D levels in blood collected from 117 children with ASD and 109 healthy controls. Blood 25(OH)D levels in ASD patients were significantly lower than in healthy controls. Accordingly, the proportion of vitamin D deficiency was approximately 89.7% in ASD patients, which was significantly higher than in healthy controls. These results suggest that children with ASD exhibit vitamin D deficiency. Moreover, vitamin D deficiency is likely to be an environmental/genetic factor of ASD. LS and FYJ conceived and designed this trial protocol, wrote the article, and approved the final version. BW and XLH were responsible for screening autism using autism-related scales. American Psychiatric Association (2013) Diagnostic and Statistical Manual of Mental Disorders, 5 th Edition: DSM-5. Arlington: American Psychiatric Publishing. Aman MG, McDougle CJ, Scahill L, Handen B, Arnold LE, Johnson C, Stigler KA, Bearss K, Butter E, Swiezy NB, Sukhodolsky DD, Ramadan Y, Pozdol SL, Nikolov R, Lecavalier L, Kohn AE, Koenig K, Hollway JA, Korzekwa P, Gavaletz A, et al. (2009) Medication and parent training in children with pervasive developmental disorders and serious behavior problems: results from a randomized clinical trial. J Am Acad Child Adolesc Psychiatry 48:1143-1154. Cannell JJ, Grant WB (2013) What is the role of vitamin D in autism? Dermatoendocrinol 5:199-204. Christensen J, Grønborg TK, Sørensen MJ, Schendel D, Parner ET, Pedersen LH, Vestergaard M (2013) Prenatal valproate exposure and risk of autism spectrum disorders and childhood autism. JAMA 309:1696-1703. Clements MR, Davies M, Hayes ME, Hickey CD, Lumb GA, Mawer EB, Adams PH (1992) The role of 1,25-dihydroxyvitamin D in the mechanism of acquired vitamin D deficiency. Clin Endocrinol (Oxf) 37:17-27. DeLuca HF (1980) The control of calcium and phosphorus metabolism by the vitamin D endocrine system. Ann N Y Acad Sci 355:1-17. Developmental Disabilities Monitoring Network Surveillance Year 2010 Principal Investigators; Centers for Disease Control and Prevention (CDC) (2014) Prevalence of autism spectrum disorder among children aged 8 years - autism and developmental disabilities monitoring network, 11 sites, United States, 2010. MMWR Surveill Summ 63:1-21. Gesell A, Halverson HM, Thompson H, Ilg FL, Castner BM, Ames LB, Amatruda CS (1940) The first five years of life: A guide to the study of the preschool child. New York: Harper & Row. Groves NJ, McGrath JJ, Burne TH (2014) Vitamin D as a neurosteroid affecting the developing and adult brain. Annu Rev Nutr 34:117-141. Guy W, Cleary PA (1976) Pretreatment status and its relationship to the length of drying-out period. Psychopharmacol Bull12:20-22. Hall SS, Lightbody AA, Reiss AL (2008) Compulsive, self-injurious, and autistic behavior in children and adolescents with fragile X syndrome. Am J Ment Retard 113:44-53. Huguet G, Ey E, Bourgeron T (2013) The genetic landscapes of autism spectrum disorders. Annu Rev Genomics Hum Genet 14:191-213. Jia F, Wang B, Shan L, Xu Z, Staal WG, Du L (2015) Core symptoms of autism improved after vitamin D supplementation. Pediatrics 135:e196-198. Kim YS, Leventhal BL, Koh YJ, Fombonne E, Laska E, Lim EC, Cheon KA, Kim SJ, Kim YK, Lee H, Song DH, Grinker RR (2011) Prevalence of autism spectrum disorders in a total population sample. Am J Psychiatry 168:904-912. Lange U (2012) Vitamin D metabolism. Z Rheumatol 71:360-362. Lardner AL (2015) Vitamin D and hippocampal development-the story so far. Front Mol Neurosci 8:58. Lord C, Rutter M, Goode S, Heemsbergen J, Jordan H, Mawhood L, Schopler E (1989) Autism diagnostic observation schedule: a standardized observation of communicative and social behavior. J Autism Dev Disord19:185-212. Lord C, Rutter M, Le Couteur A (1994) Autism Diagnostic Interview-Revised: a revised version of a diagnostic interview for caregivers of individuals with possible pervasive developmental disorders. J Autism Dev Disord 24:659-685. Leroith D (2010) Review the metabolism of vitamin D. Foreword. Endocrinol Metab Clin North Am 39:xiii-xv. Morris HA (2014) Vitamin D activities for health outcomes. Ann Lab Med 34:181-186. Parner ET, Thorsen P, Dixon G, de Klerk N, Leonard H, Nassar N, Bourke J, Bower C, Glasson EJ (2011) A comparison of autism prevalence trends in Denmark and Western Australia. J Autism Dev Disord 41:1601-1608. Schopler E, Reichler RJ, DeVellis RF, Daly K (1980) Toward objective classification of childhood autism: Childhood Autism Rating Scale (CARS). J Autism Dev Disord 10:91-103. Strömland K, Nordin V, Miller M, Akerström B, Gillberg C (1994) Autism in thalidomide embryopathy: a population study. Dev Med Child Neurol 36:351-356. Stoner R, Chow ML, Boyle MP, Sunkin SM, Mouton PR, Roy S, Wynshaw-Boris A, Colamarino SA, Lein ES, Courchesne E (2014) Patches of disorganization in the neocortex of children with autism. N Engl J Med 370:1209-1219. Volkmar FR, Cicchetti DV, Dykens E, Sparrow SS, Leckman JF, Cohen DJ (1988) An evaluation of the Autism Behavior Checklist. J Autism Dev Disord 18:81-97. Wang T, Shan L, Du L, Feng J, Xu Z, Staal WG, Jia F (2015) Serum concentration of 25-hydroxyvitamin D in autism spectrum disorder: a systematic review and meta-analysis. Eur Child Adolesc Psychiatry doi:10.1007/s00787-015-0786-1. Zielinski BA, Prigge MB, Nielsen JA, Froehlich AL, Abildskov TJ, Anderson JS, Fletcher PT, Zygmunt KM, Travers BG, Lange N, Alexander AL, Bigler ED, Lainhart JE (2014) Longitudinal changes in cortical thickness in autism and typical development. Brain 137:1799-1812.